What will ESPN do for Monday Night Football broadcasts after Jason Witten’s exit? Witten's departure leaves ESPN a lot of options to consider, from keeping just Tessitore and McFarland to internal promotions to bringing in outside figures. The news of Jason Witten exiting ESPN to return to the Dallas Cowboys creates questions about what’s next for Monday Night Football. 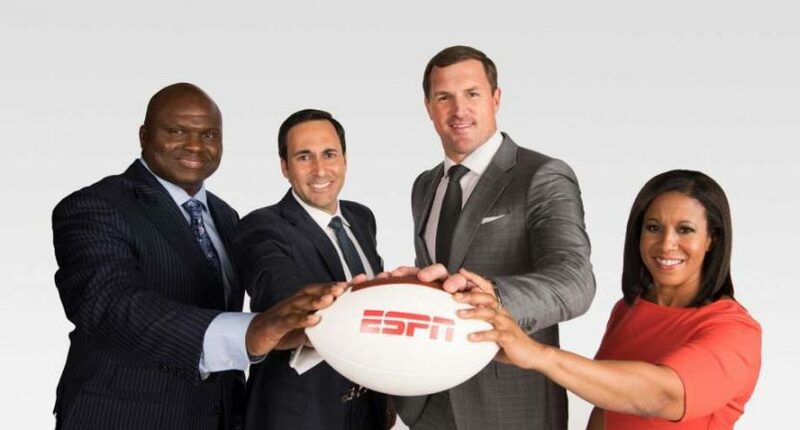 ESPN hadn’t officially announced that the MNF crew of Joe Tessitore, Witten and Booger McFarland (plus sideline reporter Lisa Salters) was returning, but comments ESPN vice president of production Lee Fitting made to The Athletic’s Lindsay Jones in December sure seemed to indicate that they planned to stick with that group for at least another year despite the criticism. Fitting also said in January that Witten and McFarland would be “seen all over” ESPN platforms leading up to the draft, a further indication this change didn’t come from ESPN’s end. Until Thursday, the biggest changes contemplated for MNF appeared to be tweaks like moving McFarland into the booth, which ESPN did for a late-season game, for their wild-card playoff game, and for the international broadcast of the Super Bowl. But the basic Tessitore-Witten-McFarland group seemed likely to be held intact despite incredible criticism, including them placing dead last in our readers’ November NFL announcer rankings (with 37 percent F grades and a score of 1.08, a further gap to the 14th-ranked team of Spero Dedes and Adam Archuleta than there was from the first- to the ninth-ranked team). Now, though, ESPN has a chance to remake the MNF booth, and there are lots of different ways they could go with it. Here are a few. Addition by subtraction: The criticisms of last year’s MNF broadcast were largely aimed at Witten, for everything from inappropriate analogies to verbal flubs. Yes, there were other problems as well, but Witten was the chief issue for a lot of viewers. And another issue was the three-person commentary team, especially with McFarland roaming the sidelines rather than in the booth; that made it harder for he and Witten to naturally time who was talking when. One possible solution here for ESPN could just be putting McFarland in the booth with Tessitore. Announcing no replacement for Witten wouldn’t be flashy and would be outside of ESPN’s usual approach, but it would provide a more standard broadcast, and it’s possible that McFarland (who many already liked more than Witten) could shine as the broadcast’s top analyst rather than one of two. He also already has a year of experience working with Tessitore, so this would mean less challenges on finding chemistry with a new figure. But McFarland was far from universally loved last year too, so there are some risks to this approach. Good god, that’s Greg Olsen’s music! What about replacing one former NFL tight end with another former NFL tight end? It’s been pretty obvious that Panthers’ tight end Greg Olsen is headed to broadcasting somewhere, with him even auditioning for MNF last year before deciding to return to the NFL. ESPN likes him; he served as a guest analyst for them in the buildup to this year’s Super Bowl, something he also did last year. And he has game-calling experience with Fox in 2017. Olsen hasn’t yet officially retired, and he said in December he was mulling “many factors” before making that decision, but Andrew Marchand of The New York Post reported this week that both ESPN and Fox had offered Olsen jobs. That ESPN offer was believed to be for studio work, perhaps including Sunday NFL Countdown, but now they have a bigger role they could perhaps toss Olsen’s way to entice him into retirement. And Olsen’s broadcasting stints so far have been received better than Witten’s, and he’d come in with both broadcasting experience in general and game-calling experience in particular, so this might be a smoother transition than it was with Witten. The chronicles of Riddick: ESPN NFL analyst Louis Riddick has always received some buzz for Monday Night Football, including last year before they went with the Tessitore-Witten-McFarland team. In fact, he reportedly told his bosses last year that he wanted the MNF job. He didn’t get it, but did sign a new extension anyway, and he could be set for a more prominent role; he also always receives buzz for NFL front office openings, and that buzz might be more muted if he has a higher-profile ESPN job. That’s not necessarily on MNF: there’s also been discussion of Riddick heading to Countdown (which is in flux as well after Charles Woodson’s exit). But Riddick has long received significant praise from viewers and has long been suggested as a MNF voice, and he’d bring an interesting perspective with his background as a scout and team executive in addition to his playing background. Could we see Rex Ryan on games again? This one would get a lot of backlash, as Ryan is far from beloved from his ESPN work so far. And his work calling the back half of a Monday Night Football doubleheader in 2017 was not well-received, including comments of “totally out of his league,” and he said afterwards he felt more “in my element” in the studio than in the broadcast booth. But this is a move ESPN might conceivably make; they’re often focused on splashy moves with big personalities, and Ryan meets those standards. Even if him getting this job would lead to a whole lot of viewer criticism. Shift in college football announcers: There are several possibilities here. One would be bringing in Kirk Herbstreit, who gets a fair bit of praise for his work on the top college team and has previously done NFL draft work, and pairing him with Tessitore and possibly McFarland. Another one would be just promoting the top college team of Herbstreit and Chris Fowler and reassigning Tessitore and McFarland. Another option could be bringing in Brian Griese, who called the MNF doubleheader game with Beth Mowins this past year before returning to the college slate. Or they could add Dan Orlovsky, who’s done both college and NFL studio work for them so far and some college game broadcasting, and received a fair bit of praise there. Or Greg McElroy, who seems to be a name on the rise on the college side. Any of those moves would leave ESPN with some college football gaps, but MNF is the bigger priority for them, and they also have a decent amount of depth on their college football teams. How about Kurt Warner? Warner might be the most likely candidate if ESPN decides not to do something in-house. He’s received a lot of praise for his studio work at NFL Network and his occasional game broadcasts there, and for his work as the analyst on Westwood One’s MNF radio broadcasts this past season. He was reportedly a serious candidate for MNF last spring as well. And there’s an appeal to having a former quarterback breaking down what offenses are doing, especially considering how well that’s gone for CBS and Tony Romo. Peyton Manning is on your side: This feels like a significant long shot, as Manning previously turned down not only ESPN’s pitch to him for MNF last year, but also Fox’s attempt last year to have him call Thursday Night Football (which he reportedly preferred over MNF thanks to the lighter schedule and it leaving weekends free). But this is exactly the kind of splashy move ESPN would love, and they do have a relationship with Manning thanks to his ESPN+ show. And if Manning has changed his tune since last year, this could maybe work. There are plenty of permutations here, of course; does the broadcast keep McFarland if they add someone else? Do they keep him on the sidelines, or move him to the booth? Does Tessitore stick around, or do they shift him back to college and find a different play-by-play voice? A whole lot feels up in the air for now. We’ll see what way ESPN eventually goes, but they certainly have plenty of options to consider.